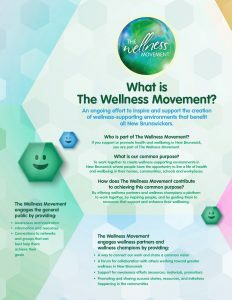 The Wellness Movement helps connect, support and celebrate wellness-related initiatives in New Brunswick. Check out the resources below for ways The Wellness Movement can help further your efforts to promote wellness and tools to connect to this province-wide wellness hub! An ongoing effort to inspire and support the creation of wellness-supporting environments that benefit all New Brunswickers. Who is part of The Wellness Movement? If you support or promote health and wellbeing in New Brunswick, you are part of The Wellness Movement. To work together to create wellness-supporting environments in New Brunswick where people have the opportunity to live a life of health and wellbeing in their homes, communities, schools and workplaces. How does The Wellness Movement contribute to achieving this common purpose? By offering wellness partners and wellness champions a platform to work together, by inspiring people, and by guiding them to resources that support and enhance their wellbeing. A number of tools were created to make it easy to align your messaging and promotional materials with those of The Wellness Movement. They are designed to be customized to fit your needs and have a professional look and feel, whether it be sharable visuals for social media, promotional tools to help promote your Wellness Week events, or kits to help you create or enhance various types of wellness-supporting environments. Check them out here. 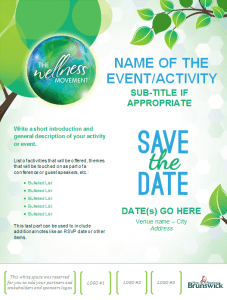 The Wellness Events Calendar is a community calendar for all to get the word out on their wellness event, activity or program. Events and activities published on the calendar are seen by thousands of visitors every month. Don’t miss out on this great visibility – make sure your events are promoted here! 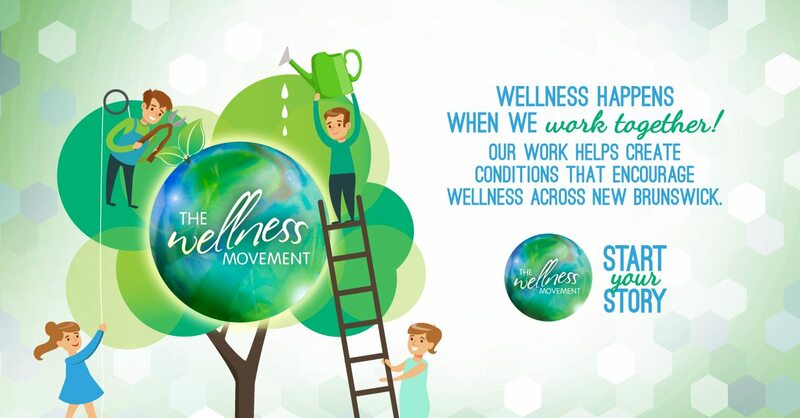 Each year, from October 1st to 7th, Wellness Week is a special time to bring the spotlight on the people, groups, initiatives, places and all the things that support our wellness in our communities, schools, workplaces and at home. Events are being held in all corners of the province to celebrate! As part of all the efforts being made to promote wellness and get the word out on annual Wellness Week, municipalities, towns, cities and villages across New Brunswick are officially proclaiming October 1st to 7th as Wellness Week in their community. The Wellness Movement celebrates and highlights success stories of individuals and groups in New Brunswick who have inspiring wellness journeys to share. Have a look and find out how storytelling helps convey bring light on the role of wellness-supporting environments, the impact of the determinants of health and the power of community. New Brunswickers are all welcome to share their own wellness stories to help inspire others! Have a look at the stories shared by the public. Do you know of a Wellness Champion with an inspiring story to tell? Share their story and help inspire others! Get in touch with the Regional Wellness Consultant for your region. 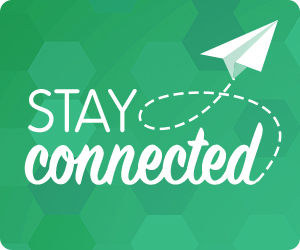 They’re there to help connect you with other local groups and initiatives and help you get started with a project of your own! Visit these other web sections to discover further content!